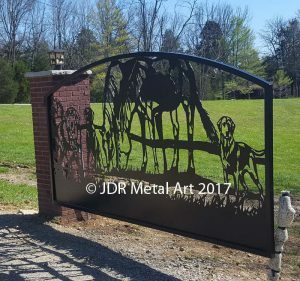 Gate Design | Great Pyrenees Dog & Grazing Horses | 12' Single Swing - Custom Driveway Gates - Iron Steel & Aluminum - JDR Metal Art - FREE Standard Shipping! 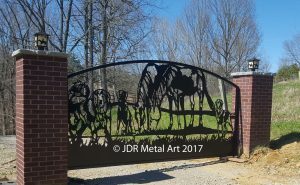 Springtime has arrived and we just got to spend a day outside in Louisville, Kentucky installing this fantastic looking dog and horse themed driveway gate design to brick columns for a residential driveway entrance. It’s a 12′ single swing gate that will be automated with a Liftmaster gate opener. 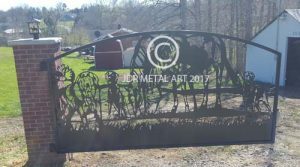 We designed this gate with grazing horses and dogs looking onward including a Great Pyrenees guard dog. 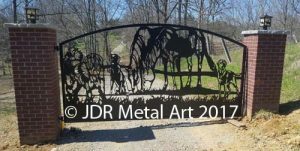 JDR Metal Art works with clients to design and install affordable and beautiful driveway gates in the Louisville area. 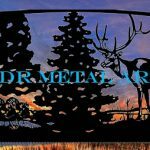 All of our gates are built and powder coated at our facility to keep quality up and costs down. 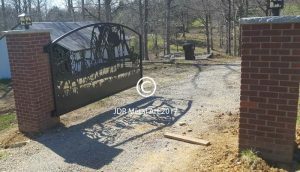 Each driveway gate we build is made especially to meet our customer’s needs. 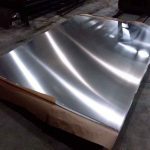 We have a wide variety of design capabilities to utilize for your upcoming driveway gate project!